As you can see I am on a roll with my Christmas cards this year. The more I do the more intricate I am getting. This is my new favorite for the week, lol. Fortunately I had cut these out in anticipation of our possibly losing power. It is truly a miracle that THIS time we didn't. However you can still see the snow that is left over and this is 5 days later. This time I went with a 5x7" card base. 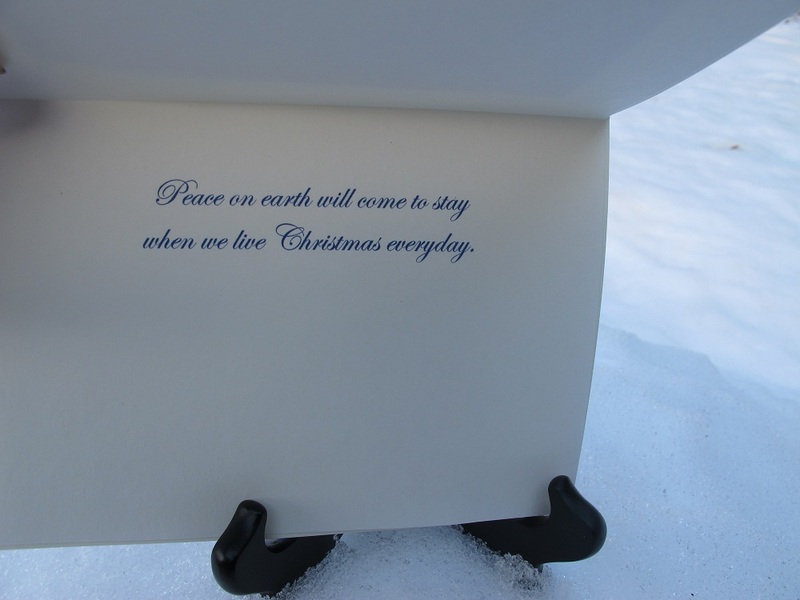 The card stock is a cream with a nice sheen to it. 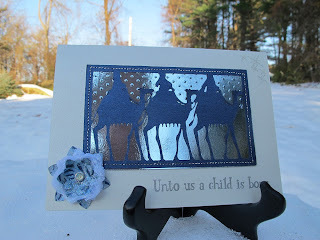 The image was cut using the Inspired Heart image @ 3" and the background is from a pale blue glossy card stock.I really love using embossing of all kinds on my cards and this has both dry and heat embossing.The background is Swiss dots whereas I used heat embossing for the stars in the upper right hand corner as well as the sentiment "Unto us a child is born". The embossing powder is a detail silver and really makes a statement! Both stamps are from Inkadinkado. 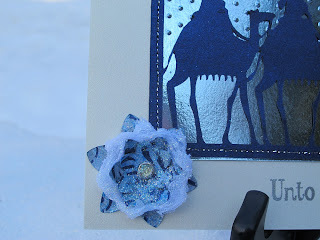 The flower was cut from Flower Shoppe cart by ProvoCraft. I cut them @ various sizes: 1 3/4" and 1- 1/2". I used a DCWV stack and Donna Salazar's technique with the tulle and added some of her Pixie Dust Glitter. I assembled the card by using silver thread to sew the image and background together before adhering it to the card base. I thought the flower would balance the stars off and the colors just seemed to fit.It gives it a quiet elegance don't ya think? I also added a sentiment on the inside and used a rich blue ink. It says: "Peace on earth will come to stay, when we live Christmas everyday." I just love this sentiment. It would be wonderful if we could have that warm feeling year round, don't you agree? I absolutely love how this card came out!!! 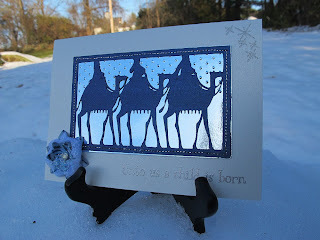 I've always loved cards with the 3 wisemen!!! Your is lovely!! !